A Norwalk man has some extra income these days: $10,000 a month for life. Richard Maillet claimed the big prize at CT Lottery’s headquarters in Rocky Hill. Unlike some big winners, Maillet declined to be photographed or to be the subject of CT Lottery’s “winner’s stories” feature. His name, however, was published Thursday on CT Lottery’s page of winners of $10,000 or more prizes. Maillet bought the lucky ticket at the 7-Eleven store at 247 Main St. 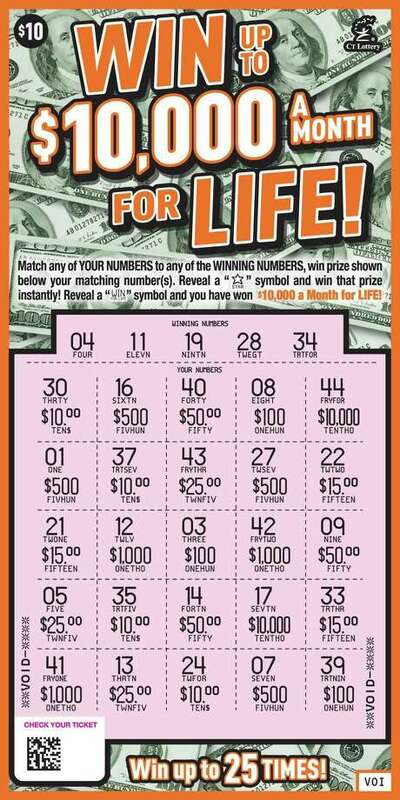 The $10,000 a Month For Life scratch game has five top prizes. As of Thursday, Maillet’s ticket was the only $10,000 a month top prize claimed. The scratch ticket costs $10. Win for Life top prizes are paid as $10,000 a month for life, with guaranteed minimum total payout of $2.4 million or as a one-time total cash option payment of $2 million. On Thursday, CT Lottery also updated its list of unclaimed big prizes. At the top of the list is a $1 million Powerball ticket that was sold at Georgetown Shell on Route 7 in Wilton. The winning numbers on that ticket are 5-14-31-40-50 Powerball-6. The holder of that ticket has until Oct. 29 to claim the ticket or the state gets the cash. A $100,000 Cash 5 ticket sold at Winners on Burnell Boulevard in Norwalk. The numbers from the April 20 drawing were 6-12-14-21-26. Prize expires on Oct. 17. A $100,000 Cash 5 ticket sold at the Merritt Country Store on Main Street in Westport. Numbers from the Sept. 26 drawing were 5-22-24-25-35. Prize expires on Sept. 26. A $100,000 Cash Five ticket sold at Stop & Shop on Villa Avenue in Fairfield. The numbers from the May 9 drawing were 12-14-23-28-29. Prize expires on Nov. 5. A $100,000 Cash Five ticket sold at The Corner Shop on Hemingway Avenue in East Haven. The numbers from the March 5 drawing were 4-7-13-21-34. Prize expires Sept. 1.